After playing as a supporting act for some bigger names, Greek newcomers Caelestia have their first LP out under their new name -- and their new genre, female-fronted melodeath. I wouldn't say the album breaks out of the genre's conventions, but if the songwriting is not groundbreaking, the songwriting shows some promise. The production is modern and slick, but the guitar riffing doesn't stand out, and the band opts for the Nightwish-style "Beauty and the Beast" duo of a harsh male death metal voice and lead vocalist Dimitra Vintsou. Her ethereally piping vocals are quite listenable when they use her, but much more of the album consists of the death metal parts than I expected, and in some ways that's not good, because of the often-generic riffing. The Grand Sublimation, a nice little atmospheric instrumental, lets the listener recover from that, though, and Blessing of Tragedy's intro, a Maiden-style single-string bit overlaid by Vintsou's vocals and featuring Soilwork's Bjorn "Speed" Strid on lead vocals, is good (the song itself is just OK). The higher-speed riffing of Secret Rite feels tighter, though, than some of the other tracks, and though it too occasionally seems to slow for no good reason, its faster portions are quite listenable. Where the band goes right is whenever they let Vintsou be front and center. Her voice is nice and it's strange that she's in a supporting role on some many songs considering she's supposed to be the lead vocalist. Lake of Decay gives her a bit more leeway, which lets the music take more of a backing role to her and makes the song better. The final track, The Rise of the Hidden Nature, is a lot like its predecessor, though the high-pitched synth piano behind the final chorus is a touch of musical strength to the song that so many tracks on this album didn't have. This isn't a great album -- just OK -- but it shows promise. 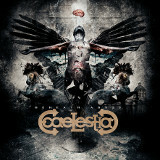 It feels like the members of Caelestia are still getting their heads around the sound they want, and that uncertainty shows in all the guest appearances, the fact that their vocalist doesn't get used a whole lot, and the by-the-numbers songwriting. But there are a few good moments to be had on this album, and if taken in the right direction it's likely that their next effort will be better.